I am still attempting to finish my series of posts on ‘chance’ – if there is such a thing – but I am still thinking about how to end it. In the meantime, here is something I just read that is very thought provoking. Also, as we have just started Advent, the following can be subject good to consider. We should be at this time asking ourselves whether or not we live our lives according to the Truth or do we remain within a world of illusion and contradiction. If we do not ask ourselves these questions then we will not be ready when our Lord returns. First a little background: he is here talking about mankind’s search for the infinite. In examining our own lives we can see this desire at work. We desire the infinite, but if we do not know where to find it then we try fulfill that desire with finite things of this world. What happens when we do this? We enjoy the novelty for a while and then tire of it, put it down, and move onto the next thing that catches our interest. But if we step back from this never ending process, instead of moving on to the next thing, we will see that there is no finite thing that will ever fulfill us. Only the infinite can do that. If we are honest then we have to admit the truth of this experience in our lives and can then recognize that it holds true for all mankind. But when we are confronted with the infinite – God – we can feel threatened because we want to be the masters of our own domain. (And this is connected to the fact that we are born into Original Sin.) Therefore, many people reject God because they want to be ‘free’ to pursue their own idea of happiness, thinking of God as nothing but the ‘fun police’ – only there to squash mankind’s happiness. As a result, those who reject God end up living their lives in a contradiction because they deny the very thing that they are seeking. With this result the following question must be asked: if there is no God then why do we have within us this desire for the infinite? If the finite is all there is and at the same time we desire the infinite, then we are find ourselves in an unintelligible universe. To this Fr. Clarke responds in the following manner. It can be shown…that there is a lived contradiction between affirming theoretically that the universe or myself is unintelligible and continuing to live and use my mind as though it were intelligible–which we cannot help but do. Thus it is finally up to each one of us either to accept his or her infinite-oriented nature as meaningful and revelatory of the real or as an opaque, illusory surd. But what good reason can one have for choosing darkness over light, illusion over meaning, for not choosing the light? Only if the darkness is more intelligible? But this does not make sense! Why not then accept my nature as a meaningful gift, pointing the way to what is, rather than what is not? You cannot have it both ways: either there is a God, which gives sense to our desire for the infinite; or there is not a God, which makes the desire we find within us into non-sense. What is a king? This is the question posed to us by our celebration today. But secondly, and more importantly, what does it mean for Christ to be our King? Regarding the first question, in an absolute monarchy, the king is one who exercises complete political power over a specific group of people. And if these people are good subjects then they will obey the king’s decisions and follow where he leads. But, of course, this kind of monarchy only works if the king is good and has the good of his subjects always in mind. And this is why earthly kingdoms which have absolute monarchies do not work – because the concerns of an earthly king often devolves into either a concern for what is good for himself or other petty concerns that hurt his subjects. Because of this, when this country was founded, we chose not to have a king, but instead established a democratic system with elected officials. And even though at this time many of our elected officials act more like dictators rather than ordinary citizens who have been elected to represent the people, nevertheless, our choice of government seems to be the best model for a planet of fallen and sinful people. We are all sinful and selfish and therefore, no single one of us should have absolute power over the rest. Now as to your other story, about Isaiah 66? It doesn’t really matter whether the Bible was open at that page thru’ a miracle or through some (unobserved) natural cause. We think it matters because we tend to call the second alternative ‘chance.’ But when you come to think of it, there can be no such thing as chance from God’s point of view. Since He is omniscient His acts have no consequences which He has not foreseen and taken into account and intended. Suppose it was the draught from the window that blew your Bible open at Isaiah 66. Well, that current of air was linked up with the whole history of weather from the beginning of the world and you may be quite sure that the result it had for you at that moment (like all its other results) was intended and allowed for in the act of creation. ‘Not one sparrow,’ you know the rest [Matthew 10:29]. So of course the message was addressed to you. To suggest that your eye fell on it without this intention, is to suggest that you could take Him by surprise. Fiddle-de-dee! This is not Predestination: your will is perfectly free: but all physical events are adapted to fit in as God sees best with the free actions He knows we are going to do. There’s something about this in Screwtape. The doctrine of the Fall (both of man and of some ‘gods,’ ‘eldils’ or ‘angels’) is the only satisfactory explanation. Evil begins, in a universe where all was good, from free will, which was permitted because it makes possible the greatest good of all. The corruption of the first sinner consists not in choosing some evil thing (there are no evil things for him to choose) but in preferring a lesser good (himself) before a greater (God). The Fall is, in fact, Pride. The possibility of this wrong preference is inherent in the v. (very) fact of having, or being, a self at all. But though freedom is real it is not infinite. Every choice reduces a little one’s freedom to choose the next time. There therefore comes a time when the creature is fully built, irrevocably attached either to God or to itself. This irrevocableness is what we call Heaven or Hell. Every conscious agent is finally committed in the long run: i.e., it rises above freedom into willed, but henceforth unalterable, union with God, or else sinks below freedom into the black fire of self-imprisonment. That is why the universe (as even the physicists now admit) has a real history, a fifth act with a finale in which the good characters ‘live happily ever after’ and the bad ones are cast out. At least that is how I see it. Today is the Feast of Saints Michael, Gabriel, and Raphael – the Holy Archangels. 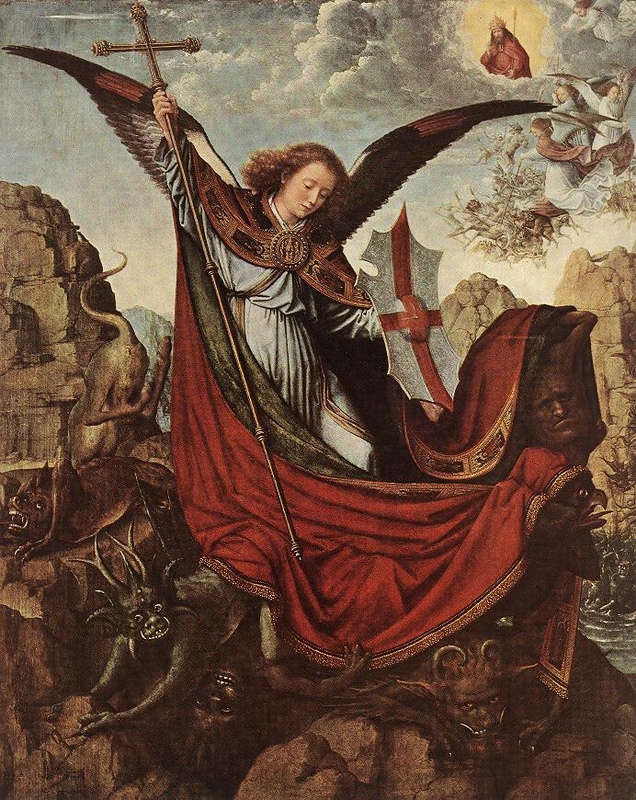 And as I was praying this morning in preparation for Mass I was reflecting on how these Holy Archangels help to protect us from the Evil One and the angels that followed him in revolt against God. But as I was thinking about this it occured to me that we can be susceptible to a false understanding of good vs. evil. In fact, to put it in such terms as ‘good vs. evil’ can lead to the danger of thinking that evil is merely the “opposite side of the coin” to that which is good. To this someone might reply, “But is not evil the opposite of that which is good?” To that question I would have to answer yes and no for the following reasons. First of all I would say yes, evil is the opposite of good because as Christians we are to do good and avoid evil. But even though, philosophically speaking, everyone pursues that which is good (but to be more accurate we must say that they pursue that which they think is good and about which they could very easily be mistaken) evil deeds are still done by countless numbers of people everyday. And it is this tendency towards sin, which runs throughout the whole history of mankind, that can lead us into a wrong way of thinking about evil. When we reflect on the prevalence of evil deeds done by mankind it may appear that evil is a power more intense or stronger than the power of good. And it is to this way of thinking that I would have to say that evil is not the opposite of good. What I mean is that to see the prevalence of evil deeds in the world and to think of the situation in terms of ‘good vs. evil’ is a dualistic and non-Christian way of understanding the world we live in. We must remember that good and evil are not equal but opposite forces. After all, if they were equal but opposite then there would be no objective standard by which to say which side was ‘good’ and which side was ‘bad’. To put this in the form of a question: if good and evil were both equal, and therefore presumably co-eternal, then how could we determine which was good and which was bad? Quite simply – we couldn’t. As a result, the only thing that really makes any sense is the Christian understanding of good and evil. God is all good. It is He who created everything and He created it good, as we are told in the book of Genesis. It was the rebellion of Lucifer, and the angels that followed him (all of which had been created by God as good creatures) that led to the introduction of evil into God’s good creation. The question may then be asked: why did God create Lucifer if He already knew Lucifer would rebel? But if we ask this question then we might as well ask why did God create anything at all? Ultimately, we cannot really answer that question. There was no need for God to create anything – but, He did. Out of the superabundance of His love He created creatures with which to share His love. But love can only be given freely and that freedom, which in itself is a good thing, implies a choice that can, and does, lead to evil. * What is this choice? It is the choosing of what we want instead of what God wants for us: Lucifer and his angels chose evil, Adam and Eve chose evil and we too, everytime we succumb to temptation, choose evil instead of that which is good. And what is that good which we should choose? Ultimately, the true Good that we all desire (and we desire it because God created us for it) is God Himself. And we, if we want to reach that ultimate Good, must in the day to day choices that we are presented with choose to do God’s will instead of our own. The Holy Archangels we celebrate today, along with all the other good angels, are there to help us when we choose that which is good but they cannot make the choice for us. We must decide to choose the good. But that brings up a serious question because I have already mentioned that we can be mistaken about that which is good. Therefore, how can we choose that which is good if we can be mistaken about it? To answer this we simply need to remember that God is good and therefore, would not leave us without guidance. And this guidance He has sent to us through His Son, Jesus Christ. Of course, we still make mistakes and that is why He left us the Sacrament of Penance. But the more and more we learn to follow Christ – to allow ourselves to be transformed into the image of Christ – the more we will not only know that which is good but also to choose it. *This choice that can lead to evil is possible only for creatures but not the Creator. To go into the reasons why this is so would make this post too long. Perhaps a topic for another day. Two day ago we celebrated the anniversary of the signing of the Declaration of Independence. It was on that day 238 years ago that the founders of this country declared their independence from a tyrannical government that tried to choke the air of freedom out of the people of this land. The founders of this country understood that mankind must be free and so they broke away from that oppressive government at the risk of their own lives. But, in considering this freedom that they won for us and that we now enjoy, we come up against a very important question – what does this freedom give us the “freedom” to do? The reason that we must ask this question is because our country now suffers from a very distorted view of what freedom is. For example, it is the rule of law in this land that women have the “freedom” to abort their children and it is increasingly becoming the law that people have the “freedom” to “marry” someone of the same gender. But are we ever really free to do such immoral acts, even it if is legal? Both of these wrong-headed notions of freedom – and others – come from the fact that the ‘idea of freedom’ in this country has become one of the freedom to do whatever we wish – that there are no universal moral standards by which to measure what we should or should not do. In other words, there is prevalent today a disordered way of thinking, which for many people is subconscious, that says there is no real way to determine right from wrong and that anyone who tries to do so is to be labeled a narrow-minded and archaic hate-monger. And it is this disordered thinking that leads even faithful churchgoers to say things like this, “Well, I do not believe that such and such is right; but if someone else wants to do it then who am I to say that they shouldn’t?” This attitude is – quite simply – wrong and, therefore, we must ask why this type of distorted thinking is so prevalent within our society? To begin to answer this we must first acknowledge that mankind wants to be happy. And since I have made reference to the 4th of July we can of course remind ourselves that the Declaration of Independence says we have the right to pursue happiness. In addition, we should also remember that God Himself wants us to be happy. But, without a correct understanding of what will and what will not make us happy, many people fall into the trap of chasing this or that ‘thing’ thinking that it is the thing that will make them happy. It starts when we are children when we think to ourselves, “If only I could have that toy or that piece of candy, then I would be happy.” And then throughout the rest of our lives it really does not change that much. There are many adults that still pursue various things they think will make them happy – if only I could have that man or woman to be my spouse, if only I had that job, house, car, boat, home theater, vacation, etc., then I would be really and truly happy. But in the end none of these things can satisfy us because we were not created to pursue them as our ultimate goal. To be sure, God did create good things for us to enjoy but we can only really enjoy them if we are willing to be without them. But why is it that these good things can make us so unhappy once we have obtained them? It is because we have forgotten, or perhaps never knew, that we have been created by God and for God – He is our ultimate goal – and if we put anything He has created as the center and ultimate goal of our life then we can never be truly happy. To say it another way, we need to understand and live our lives in accordance with the fact that the primary reason for our existence is to know and love God. With this in mind we can now understand how it is that we should use the freedom that we enjoy in this country. If it is God who has created us, then it is He who knows what is best for us. And He hasn’t left us without guidance in this matter. Our Lord Jesus Christ has revealed to us the Way to happiness with God. We heard Jesus say today, “no one knows the Son except the Father, and no one knows the Father except the Son and any one to whom the Son chooses to reveal him.” We, as Catholics, know and believe that Jesus is the revelation of all that we need to know in order to be truly happy. The freedom that God Himself has given to us and that we enjoy in this country can only rightly be used in the pursuit of our ultimate end: to know and to love God. True, God gave us free will and we can, if we wish, choose to do that which is wrong. But if we misuse our freedom in such a way then we will not, and in fact, we cannot be happy. Our freedom and our happiness rests in God alone. And until we – as individuals and as a nation – understand and accept that fact then we can never truly be happy or free. Freedom – but to do what? Freedom is the power, rooted in reason and will, to act or not to act, to do this or that, and so to perform deliberate actions on one's own responsibility. By free will one shapes one's own life. Human freedom is a force for growth and maturity in truth and goodness; it attains its perfection when directed toward God, our beatitude. As long as freedom has not bound itself definitively to its ultimate good which is God, there is the possibility of choosing between good and evil, and thus of growing in perfection or of failing and sinning. This freedom characterizes properly human acts. It is the basis of praise or blame, merit or reproach. In this time when freedom means to most people the freedom to do whatever they want, we would do well to consider the Church's teaching on the matter. Yes, we have free will to choose between good and evil but we must never forget that there is good and evil to choose between. Many people in our society want to do away with any idea that there is sin – that there is good and evil – in order that they can pursure whatever sinful inclination they may have without remorse. But this is not possible. If we want to be truly free and to be happy then we must use our freedom to live in accordance with the will of God. After all, He made us, He knows and wants what is best for us, and if we follow Him then we will be happy for all of eternity. Yesterday, while reading Leisure: The Basis of Culture, I came across a term with which I was unfamiliar: capax universi. Therefore, as I usually do, I looked it up on my iPad. This term seems to mean, at least in philosophy, that the mind has the ability to know all things. I found this definition from one of the first entries that popped up in the search engine: an article by Fr. James V. Schall, S.J. This name immediately caught my attention because he happens to be the man who wrote the foreword for Leisure: The Basis of Culture, which is, of course, where the term came from that I was looking up! To this many may say that it was mere coincidence. But I do not believe in coincidence. Things like this happen for a reason and, therefore, I read the whole article. It is interesting that the article was very similar in meaning to Leisure: The Basis of Culture, and he even mentions the book in the article. But there is one thing in particular that caught my attention. In his discussion of truth he says the following, “Truth is the conformity of our minds with what is.” By this he would not mean that the veracity of something is dependent upon human thought nor would he mean that truth only exists if the human mind has conceived it. After all, Jesus Christ is the Truth and He exists whether or not we understand Him or even if we think He doesn't exist at all. No, truth is not dependent upon the human mind. Instead, (what I think) he means is that we can and do know the truth if our understanding is in conformity with how things truly are. For example, we cannot possibly understand the truth of the universe around us if we start with the false premise that it is all here by some big cosmic coincidence. Certainly, there are many atheistic scientics that know plenty of ‘facts’ about the universe but they will never understand the truth of it until they accept it for what it really is – God's own creation. But this understanding has consequences outside the lives of atheistic scientists. In fact, it is something every Christian needs to know and understand in order to come closer to God. If we would come closer to God then we must start with a correct understanding of the universe: God created all things – including ourselves. Therefore, we do not belong to ourselves and we cannot make our own rules concerning what is right and what is wrong. True, God gave us all free will and we can do as we please whether it be right or wrong. But to go off and blaze our ‘own’ path in the name of freedom with no regard for the truth of things (that we are creatures under Someone's authority) would be to become less than human because a creature cannot become something that it was not created to be. A mouse could not become an elephant even if it could desire to do so. And man cannot become God just because he makes up his own rules. In the end he may get some of the ‘facts’ right (like the atheistic scientist) but he will never understand the Truth. Sorry I did not post anything at all last week. My kids were on Easter break, my parents were in town and I was enjoying not having anything in particular to do. Today, just something quick from Lewis.